I took three years of high school Spanish, spanning from my freshman through junior year. Ten years after my final class, I'd guesstimate that I have a Spanish vocabulary of roughly 150 words. I can count to 100, pronounce and accurately describe most menu items at Tex-Mex restaurants, and know a handful of Spanish curse words. Before going to Peru back in June, I brushed up on my Spanish pleasantries, learned how to order my beverages sin hielo, and reminded myself that el baño and la biblioteca are two very different places, that should not under any circumstance be confused. I really wish that I'd paid more attention back in high school Spanish, because as an adult I can finally understand the value of knowing a second language. As a teenager, the only thing I cared about in that class was the "fiesta" we got to have every semester. Our fiesta was really just a day off from learning, where everyone brought in junk food to pig out on for the whole 45-minute class. 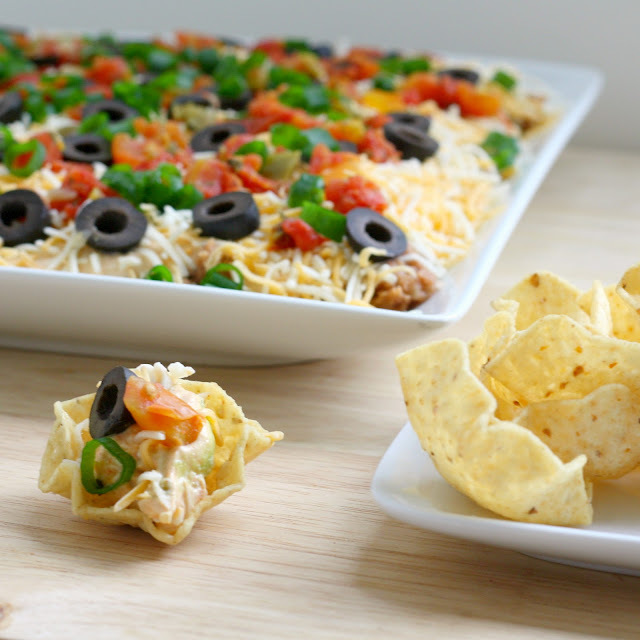 This dip was always my contribution to our fiesta, much to my poor mom's dismay. She got stuck making this dip for every single Spanish class party. A considerate kid would've signed their mother up for napkin duty. I volunteered her for $15 worth of dip and tortilla chips, roughly six times throughout high school. Sorry Mom! Gone are the days of sharing this taco dip with 25 of my grody classmates. My mom doesn't make this dip for me anymore; I whip it up myself whenever Annie comes to town. She was here last weekend to go on our annual Christmas bar crawl, and we inhaled this on her first night here. You can make this recipe more homemade if you desire, but I just use canned refried beans and packaged guacamole. My mom has always used chopped tomatoes as a topping, but the winter tomatoes where I live taste like old cotton balls soaked in V8 juice, so I opted for Rotel instead. It was a delicious substitution that I think I'll stick with the next time I make it. In a small bowl, mix sour cream, mayonnaise, and taco seasoning. Set aside. On a large plate, spread the refried beans into an even layer. Spread the guacamole on top of the beans, and then spread on the sour cream mixture. Top with cheese, scallions, olives, and Ro-tel. Source: My lovely mom, with a couple changes by me! I love black olives....dip looks delicious. Yum! Yum! This looks good. I made a taco dip recipe I found in a magazine and it wasn't very good, but this looks great, I will have to try this! I could eat that whole think myself. I love this dip. Great picture. Come over and visit. We have a wonderful pimento cheese quiche appetizer for the holiday season. Merry Christmas. Yummmmm!!! I love love love mexican food. Including taco dip. I've never made refried beans - I might give that a shot one of these days, just for some taco dip! god i love taco dip!!! I'm thinking Sunday Football Food!! Love this! That's really beautiful! Yum yum!